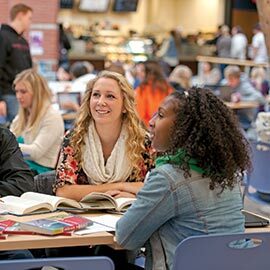 Explore the written word as medium for creativity, persuasion, and engagement with life’s most persistent questions in the Laurier Waterloo English program. Through innovative teaching, diverse courses, and a strong emphasis on reading and writing skills, our English program helps you work at the cutting edges of literary studies and creative writing. The program will ground you in the core texts of English literature while introducing you to emerging and experimental texts and critical approaches. English courses offer exciting ways to explore media and culture, along with history and theory. Many of our courses integrate an experiential component so you can apply your learning outside the classroom. Our program is home to the popular course EN190: Introduction to Academic Writing. We offer classes in creative writing taught by award-winning writers of fiction and poetry. Our fourth-year seminar courses in specialized topics provide a small-class experience in which you can develop your leadership and research skills with other graduating students. We offer new minors in Creative Writing, Writing for Career and Community and Youth and Children: Texts and Cultures. You can choose to dive straight into a Master of Arts (MA) in English after completing your Bachelor of Arts (BA): apply for our BA + Master's program.